Investorideas.com, a global news source and leading investor resource covering actively traded sectors announces this week’s additions to its global stock directories in Artificial Intelligence (AI), Tech, biotech and mining. 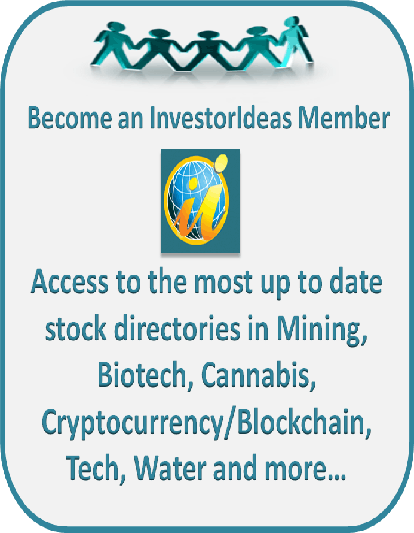 Point Roberts, WA, Delta BC – December 8, 2017 – Investorideas.com, a global news source and leading investor resource covering actively traded sectors announces this week’s additions to its global stock directories in Artificial Intelligence (AI), Tech, biotech and mining. This week’s latest tech companies are involved in cloud, fintech, cyber security, software and the internet advertising tech sectors. Also added this week are the newest Canadian Listed Artificial Intelligence (AI) companies; EVITRADE Health Systems Corp. (CSE:EVA) and Novoheart Holdings Inc. (TSX:NVH.V). Both companies cross-over into the biotech/life sciences stock list. The other new biotech company is also Canadian Listed - NanoSphere Health Sciences Inc. (CSE:NSHS) which is specializing in the creation of a NanoSphere Delivery System™ (NDS) for the supplement, nutraceutical, over-the-counter pharmaceutical industries, and beyond. And finally, the CSE listed mining company, Gorilla Minerals Corp. (CSE:GOCO), a public junior mining and exploration company with an interest in a number of mineral claims located in British Columbia and the Yukon Territory had been added the mining stocks list. Ookami Limited (ASX:OOK.AX) through its subsidiary, Akela Capital Pty Limited, operates as a technology and software development company in Western Australia. The company develops its Akela proprietary financial services software platform, which provides Australian Financial Services License holders with a streamlined total managed solution to capital raisings and the distribution of public and private offerings. Its Akela platform is also used as a White Label solution that enables the integration of an organization’s branding and presence to its clients through the Web based platform and mobile app for corporate clientele. Mobi724 Global Solutions Inc. (CSE:MOS) a leader in the FinTech industry based in Montreal (Canada), offers a unique and fully integrated suite of payment & digital marketing solutions with a combined EMV Payment, Card Linked Offers, Digital Marketing & Business Intelligence platform that works on any card and any mobile device. MOBI724's solutions add value to all types of transactions benefiting banks, retailers and cardholders by leveraging available user and purchasing data to increase transaction volumes and spend. MOBI724 provides a turnkey solution to its clients to capture card transactions on any mobile device, at any point of sale or from any payment card. MOBI724 provides its customers with full and comprehensive traceability and enriched consumer data through its offering. Its solutions enable card associations, retailers, manufacturers, offer providers, mobile operators and card issuers to create, manage, deliver and "track and measure" incentive campaigns worldwide to any mobile device and allow its redemption at any point of sales. Kyckr Limited (ASX:KYK.AX) provides products for the authentication of businesses worldwide. It develops API’s and cloud based decision engines for KYC due diligence and customer on-boarding. The company’s products offer its customers with automated data cleansing, remediation, and on-going monitoring that enhance customer on-boarding timelines. Its clients include banks and other sectors that require protection against money laundering, terrorism financing, and tax fraud. Open Source Health Inc. (CSE:OSH) takes a truly patient-centered approach and is in the business of providing a cloud based, real-time precision medicine platform to Clinics and Practices that focus on Women’s Health. Open Source Health Inc. is leading the digital transformation of healthcare by leveraging the latest trends in digital health, precision medicine, molecular medicine, integrated and personalized health, social health and participatory medicine. This is medicine for the 21st century. RESAAS Services Inc. (CSE:RSS) is a cloud-based social business platform built for the real estate services industry. RESAAS brings proprietary real-time technology into the business of real estate and transforms how real estate data flows between real estate agents, brokers, associations and MLSs. SponsorsOne Inc. (CSE:SPO) With the SponsorsCloudTM platform, SponsorsOne is creating Brand focused proprietary ad networks. Data driven marketing campaigns and creative combined with a proprietary social ad network will change the face of the agency and the way Brands connect to their customers. Brands can now inspire real movements around their products and services in which their most valuable customers become their best salespeople producing far greater ROI than current social media advertising methods. SponsorsOne is also the creator of a proprietary SponsorsCloud and a Social Sponsorship Currency that gives consumers real compensation for their authentic social media engagement (blogs, videos, tweets, pins and posts) along with a Social Marketplace to trade their Social Currency for products and services with the Brands they love. Zyber Holdings Limited (ASX:ZYB.AX) allows businesses to transact, share data and collaborate across multiple devices and operating systems all within one, easy to install, secure centralized platform without leaving a digital footprint on anyone’s device. Zyber is the first solution to provide a completely secure platform from which to share and collaborate on sensitive data over open networks with anyone, on any device while eliminating the negligent end user as a threat. Qwick Media Inc. (CSE:QMI) is a leading provider of touchscreen technology, specializing in turnkey interactive self-service kiosk and digital signage solutions for both indoor and outdoor environments with applications in all major industries. We are market-tested self-service experts, 100% developed and built in-house, focused on your results. Our dedicated team of designers, software and hardware engineers, and marketers is creative, knowledgeable and experienced in delivering a wide range of projects that drive customer success. EVITRADE Health Systems Corp. (CSE:EVA) offers a physiologically interactive computing platform that integrates medical devices and artificial intelligence applications into a fully automated, personal health management system for hypertension, arrhythmia, diabetes, and obesity. The current focus is a telehealth platform for the normalization of cardiometabolic power in terms of blood pressure, blood glucose, and body weight – and the monitoring of the physiological response to medical solicitations, mainly medication, diet, exercise, and lifestyle changes. Novoheart Holdings Inc. (TSX:NVH.V) is a global stem cell biotechnology company pioneering an array of next-generation human heart tissue prototypes. It is the first company in the world to have engineered miniature living human heart pumps that can revolutionize drug discovery, helping to save time and money for developing new therapeutics. Also known as 'human heart-in-a-jar', Novoheart's bioartificial human heart constructs are created using state-of-the-art stem cell and bioengineering approaches, and are utilized by drug developers for accurate preclinical testing as to the effectiveness and safety of new drugs, maximizing the successes in drug discovery whilst minimizing costs and harm caused to patients. AI: December 2017 - Publishes Landmark Study Demonstrating the Use of Machine Learning to Accelerate Drug Screening: Novoheart's publication titled, "Machine Learning of Human Pluripotent Stem Cell-Derived Engineered Cardiac Tissue Contractility for Automated Drug Classification" was published in the November 14, 2017 issue of Stem Cell Reports and can be accessed online here. Novoheart provided the financial support needed for this project. A provisional patent application has been filed with the United States Patent and Trademark Office (USPTO). NanoSphere Health Sciences Inc. (CSE:NSHS) is a biotechnology firm specializing in the creation of a NanoSphere Delivery System™ (NDS) for the supplement, nutraceutical, over-the-counter pharmaceutical industries, and beyond. Its patent-pending NanoSphere Delivery System and industry-first line of bioavailable NanoSphere Gels, represent a significant milestone and one of the most important developments for advancing the non-invasive delivery of biological agents in over 25 years. As an innovative biotechnology company, we are developing a robust and growing portfolio of novel product candidates generated by our patent-pending NanoSphere Delivery System. We address multiple areas including dietary supplements, pharmaceutical and OTC medications, cannabinoids, skin care, animal health, etc. Gorilla Minerals Corp. (CSE:GOCO) is a public junior mining and exploration company operating out of Vancouver. The company has an interest in a number of mineral claims located in British Columbia and the Yukon Territory. Additional info regarding BC Residents and global Investors: Effective September 15 2008 - all BC investors should review all OTC and Pink sheet listed companies for adherence in new disclosure filings and filing appropriate documents with Sedar. Read for more info: BCSC releases rule for U.S. OTC issuers. Global investors must adhere to regulations of each country. Additional info regarding BC Residents and global Investors: Effective September 15 2008 - all BC investors should review all OTC and Pink sheet listed companies for adherence in new disclosure filings and filing appropriate documents with Sedar. Read for more info: www.bcsc.bc.ca/... Global investors must adhere to regulations of each country.